AC's departing Dante with wood chip hoppers heading for the Fremont Branch. Pushers on the rear of the Fremont Turn heading for the wood chipper. 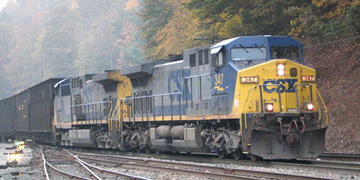 MTY coal train heading north through Dante, VA. The "Orange Pumpkin" seen here, is ready to do some track work near Dante. The Undercutting Crew waiting for clearance at MP# 35, the North end of Dante. Knox Kershaw Inc. equipment located in Dante. They where getting ready to undercut Sandy Ridge Tunnel. The engine facility was always busy in Dante. The turntable at Dante is still used for mine turn power and pushers that need to be turned. CSX has built a new office building and a storage shed seen in the distance.